The Geoengineering Model Intercomparison Project (GeoMIP) has been highly successful in identifying robust climate model response to various geoengineering scenarios. There are currently seven core GeoMIP simulations, with another four submitted as GeoMIP's contribution to CMIP6. These experiments evaluate model response to various forms of geoengineering, focusing on solar dimming, stratospheric sulfate aerosol injections, marine cloud brightening via sea spray, and cirrus cloud thinning. In this special issue, we examine results from these simulations that have been conducted by 15 climate modeling centers from around the world. The results presented here provide a key source of information about the range of potential climate effects from geoengineering, any possible unintended side effects that geoengineering may cause, and the efficacy of geoengineering as a response to climate change. 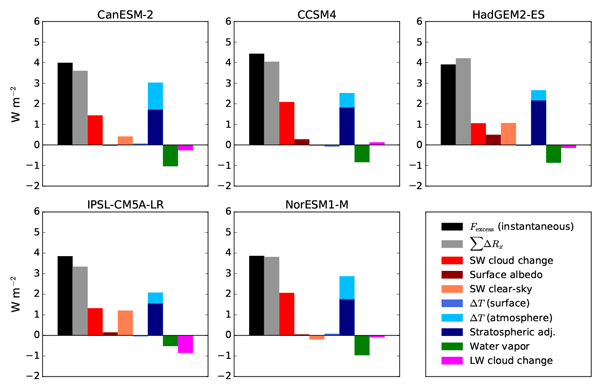 These simulations also reveal fundamental climate responses to radiative forcing, illuminating various feedback processes and interactions between different components of climate models. We analyzed streamflow and flood frequency under the stratospheric aerosol geoengineering scenario simulated by climate models. Stratospheric aerosol geoengineering appears to reduce flood risk in most regions, but the overall effects are largely determined by the large-scale geographic pattern. Over the Amazon, stratospheric aerosol geoengineering ameliorates the drying trend here under a future warming climate. Many side effects of sulfate geoengineering have to be analyzed before the world can even consider deploying this method of solar radiation management. 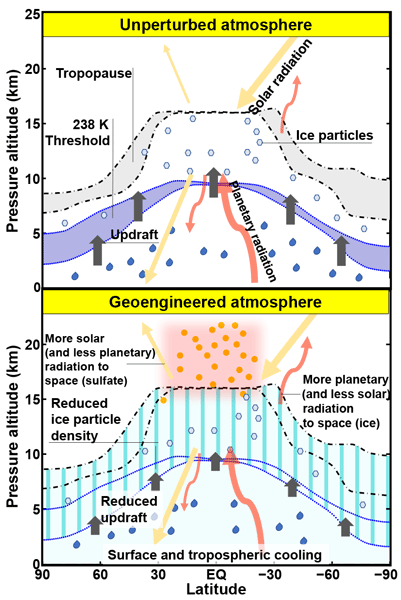 In particular, we show that ice clouds in the upper troposphere are modified by a sulfate injection, producing a change that (by allowing for more planetary radiation to escape to space) would produce a further cooling. This might be important when considering the necessary amount of sulfate that needs to be injected to achieve a certain target. Marine cloud brightening has been proposed as a means of geoengineering/climate intervention, or deliberately altering the climate system to offset anthropogenic climate change. 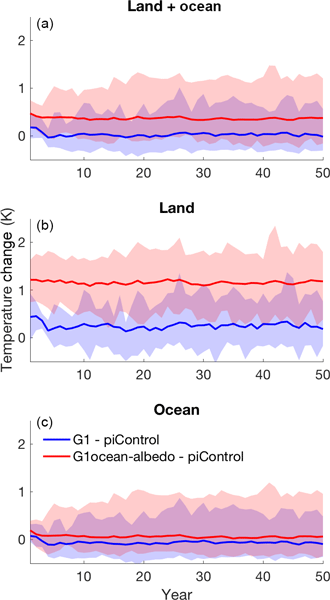 In idealized simulations that highlight contrasts between land and ocean, we find that the globe warms, including the ocean due to transport of heat from land. This study reinforces that no net energy input into the Earth system does not mean that temperature will necessarily remain unchanged. In simulations with different climate models in which the strength of the Sun is reduced to cancel the surface warming from a quadrupling of atmospheric carbon dioxide, low cloud cover decreases, high cloud cover increases, the upper troposphere and stratosphere cool, and water vapor concentration decreases. The stratospheric cooling and low cloud reduction result in more sunlight reduction being needed than originally thought. We examine extreme temperature and precipitation under climate-model-simulated solar dimming and stratospheric aerosol injection geoengineering schemes. Both types of geoengineering lead to lower minimum temperatures at higher latitudes and greater cooling of minimum temperatures and maximum temperatures over land compared with oceans. 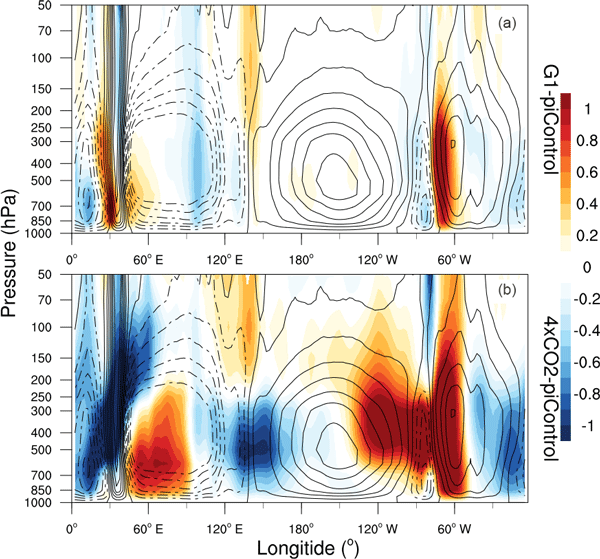 Stratospheric aerosol injection is more effective in reducing tropical extreme precipitation, while solar dimming is more effective over extra-tropical regions. 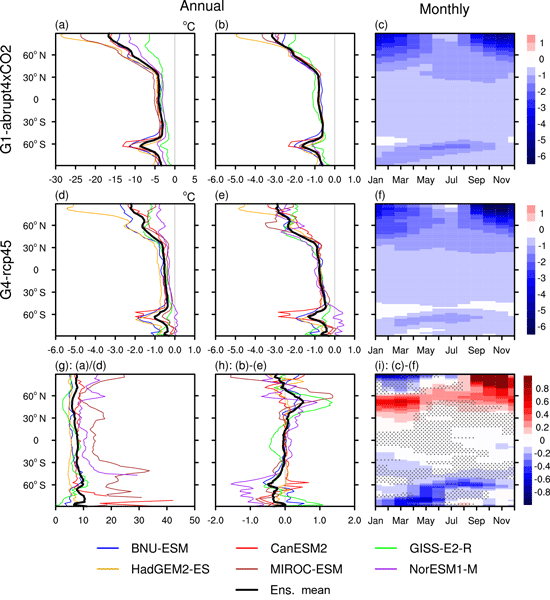 (1) Genesis potential and ventilation indices are assessed in 6 ESMs running RCP4.5 and G4, in 6 tropical cyclone genesis basins. (2) Genesis potential is reasonably well parameterized by simple surface temperature, but other factors are important in different basins and models such as relative humidity and wind shear. (3) The Northern Hemisphere basins behave rather differently from the southern ones, and these dominate TC statistics. G4 leads to significantly fewer TCs globally than RCP4.5. This is an examination of both the zonal and meridional tropical circulations under G1 geoengineering using eight ESMs. 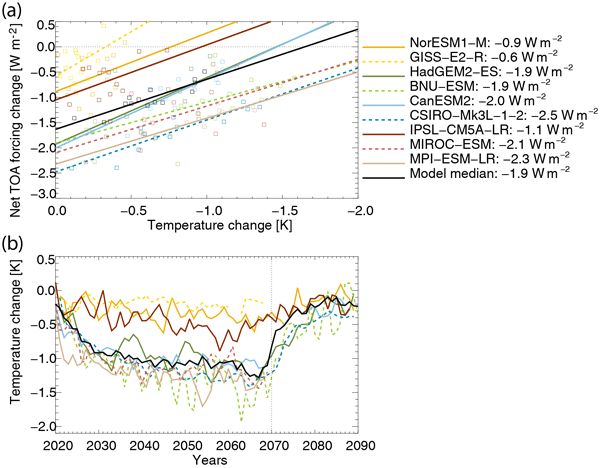 Drivers of the changes are examined, with meridional temperature gradient being the dominant factor. The Hadley circulation is changed under G1 differently for each hemisphere, but changes are small compared with abrupt4xCO2. Changes in the Walker circulation are subtle but potentially important in some regions, and ENSO impacts circulations only slightly differently under G1. Sulfate geoengineering is a proposed technique that would mimic explosive volcanic eruptions by injecting sulfur dioxide (SO2) into the stratosphere to counteract global warming produced by greenhouse gases by reflecting part of the incoming solar radiation. In this study we use two models to simulate how the injected aerosols would react to dynamical changes in the stratosphere (due to the quasi-biennial oscillation - QBO) and how this would affect the deposition of sulfate at the surface. We use a state-of-the-art stratospheric aerosol model to study geoengineering through stratospheric sulfur injections. We find that the efficiency may decrease more drastically for larger injections than previously estimated and that injections at higher altitude are not more effective. This study may provide additional evidence that this proposed geoengineering technique is still more complicated, probably less effective, and may implicate stronger side effects than initially thought. An artificial stratospheric sulfur layer heats the lower stratosphere which impacts stratospheric dynamics and transport. The quasi-biennial oscillation shuts down due to the heated sulfur layer which impacts the meridional transport of the sulfate aerosols. The tropical confinement of the sulfate is stronger and the radiative forcing efficiency of the aerosol layer decreases compared to previous studies, as does the forcing when increasing the injection height. We present results from coordinated simulations with three Earth system models focusing on the response of Earth’s radiation balance to the injection of sea salt particles. We find that in most regions the effective radiative forcing by the injected particles is equally large in cloudy and clear-sky conditions, suggesting a more important role of the aerosol direct effect in sea spray climate engineering than previously thought. Ozone is a key air pollutant. We model two geoengineering schemes, stratospheric sulfur injection and solar irradiance reduction, to compare their impacts on atmospheric ozone concentrations. With the nearly identical global mean surface temperature reduction, solar dimming increases global average surface ozone concentration, while sulfate injection decreases it. This difference is due to different stratosphere–troposphere exchange of ozone and tropospheric ozone chemistry in the two scenarios. Based on simulations, equatorial stratospheric sulfur injections have shown to be an efficient strategy to counteract ongoing global warming. However, equatorial injections would result in relatively larger cooling in low latitudes than in high latitudes. This together with greenhouse-gas-induced warming would lead to cooling in the Equator and warming in the high latitudes. Results of this study show that a more optimal cooling effect is achieved by varying the injection area seasonally. We find stratospheric sulfate aerosol injection geoengineering, G3, can slow shrinkage of high-mountain Asia glaciers by about 50 % by 2069 relative to losses from RCP8.5. The reduction in mean precipitation expected for solar geoengineering is less important than the temperature-driven shift from solid to liquid precipitation for forcing Himalayan glacier change. The termination of geoengineering in 2069 leads to temperature rise of 1.3 °C and corresponding increase in glacier volume loss rate. Geoengineering is a controversial proposal to counteract global warming by reducing the incoming solar radiation. Solar dimming could restore preindustrial temperatures, but global rainfall patterns would be altered. 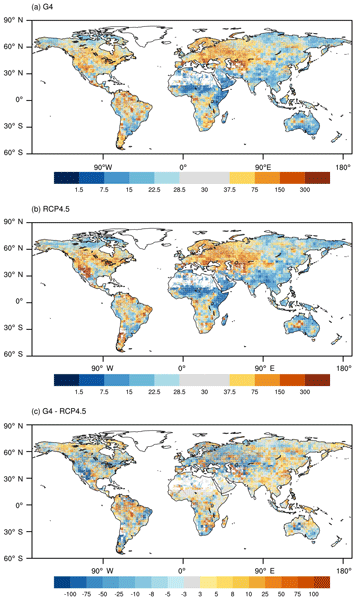 We analyze the global rainfall changes in 11 climate model simulations of solar dimming to better understand the underlying processes. We conclude that tropical precipitation would be substantially altered, in part due to changes in the large-scale atmospheric circulation. Is increasing ice crystal sedimentation velocity in geoengineering simulations a good proxy for cirrus cloud seeding? Cirrus clouds have, unlike other cloud types, a warming impact on climate. Decreasing their frequency therefore leads to a cooling effect. Cirrus ice crystals grow larger when formed on solid aerosols, inducing a shorter cloud lifetime. We compare simplified simulations of stripping cirrus out of the sky with simulations of seeding by aerosol injections. While we find the surface climate responses to be similar, the changes in clouds and cloud properties differ significantly. This study analyses shortwave radiation (SW) in the G4 experiment of the Geoengineering Model Intercomparison Project. G4 involves stratospheric injection of 5 Tg yr−1 of SO2 against the RCP4.5 scenario. The global mean forcing of the sulphate geoengineering has an inter-model variablity of −3.6 to −1.6 W m−2, implying a high uncertainty in modelled processes of sulfate aerosols. Changes in water vapour and cloud amounts due to the SO2 injection weaken the forcing at the surface by around 50 %. The National Center for Atmospheric Research CESM-CAM4-CHEM global climate model was modified to simulate a scheme in which the albedo of the ocean surface is raised over the subtropical ocean gyres in the Southern Hemisphere. Global mean surface temperature in G4Foam is 0.6K lower than RCP6.0, with statistically significant cooling relative to RCP6.0 south of 30° N and an increase in rainfall over land, most pronouncedly during the JJA season, relative to both G4SSA and RCP6.0. Climate model simulations show that stratospheric sulfate geoengineering could impact the terrestrial carbon cycle by enhancing the carbon sink. Enhanced downward diffuse radiation, combined with cooling, could stimulate plants to grow more and absorb more carbon dioxide. This beneficial impact of stratospheric sulfate geoengineering would need to be balanced by a large number of potential risks in any future decisions about implementation of geoengineering. This is a first look at how the El Niño/Southern Oscillation (ENSO) might change under a regime of stratospheric geoengineering (GE). We find neither ENSO event frequency nor ENSO event amplitude will be different under various GE experiments than they would under unabated global warming. We additionally find substantial disagreement between models in depicting ENSO amplitude and frequency. Additionally, output from several GCMs is excluded from comparison due to unrealistic ENSO variability. 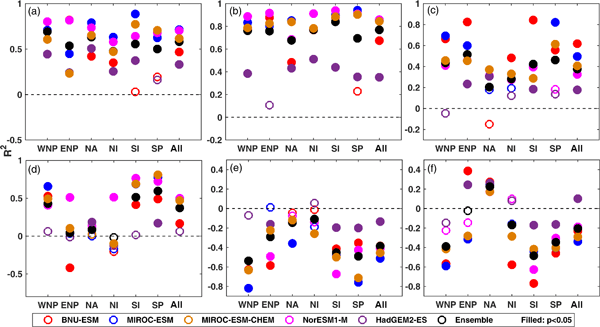 Simulations conducted in the GeoMIP and IMPLICC model intercomparison studies for climate engineering by stratospheric sulfate injection and marine cloud brightening via sea salt are analysed and compared to the reference scenario RCP4.5 for 2020 - 2060. The focus is on extremes in surface temperature and precipitation. It is found that mostly the extreme changes follow the mean changes and that extremes are also in general well mitigated, except for polar regions. What is the limit of climate engineering by stratospheric injection of SO2? The injection of sulfur dioxide is considered as an option for solar radiation management. We have calculated the effects of SO2 injections up to 100 Tg(S)/y. Our calculations show that the forcing efficieny of the injection decays exponentially. This result implies that SO2 injections in the order of 6 times Mt. Pinatubo eruptions per year are required to keep temperatures constant at that anticipated for 2020, whilst maintaining `business as usual' emission conditions.